When my boys were little there was one thing about their nightly routine that I absolutely LOVED. After their bath I would give them a good rub down with either lotion or some kind of good smelling massage oil. Not only did this ritual get them ready for a peaceful night of sleep, but it also was great for their skin. My youngest had eczema, so doing this helped his dry skin. I was introduced to Baby Mantra Calming Massage Oil and I love it. I don't have a little baby to rub down with it yet, but I have used it on my 4 year old's peeling fingers. I even got him to let me put some all over him one night after his bath. He smelled so good, and his skin was so soft! He is not up to letting me do a rub down every night, but on the nights that he is up for it I grab this awesome massage oil from Baby Mantra! This massage oil is free of toxins, artificial preservatives, dyes, chemicals or fragrances. I love that it is contains contains all natural and organic ingredients. Baby Mantra's Calming Massage Oil is rich in vitamin E, which is great for a mom of little boys! They get little scratches and dings all the time. So when I see their little booboo's healing up I grab this to rub on it. I have always used vitamin E to reduce or prevent scarring. This wonderful little bottle of massage oil is also gluten free, cruelty free and vegan! There is so much wonderful goodness in this little bottle of oil! The Avocado, Apricot, Grape seed, & Jojoba give it a light fragrance that is delightful. I am not a fan of oils that have a strong smell and my boys are not either. So this is great for us! I cannot wait to have another little baby to use this oil on. I love how relaxed my boys were after I would rub their little feet and legs. This is becoming more and more recognized as a great thing to do with our little ones. Getting a good night time routine that includes a warm bath and massage can help your little one sleep better. 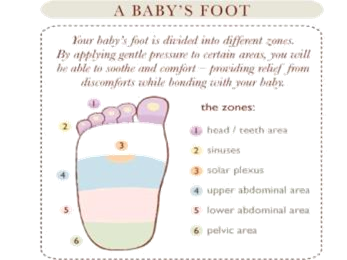 Baby Mantra has lots of other really great products that are free of toxins and other harmful ingredients. You can keep up with them on Facebook to hear about all their products. I love this. I truely feel massaging their feet works. I do it all the time to my granddaughter. I have two little one's on the Autism Spectrum and we just recently started using Essential Oils a month ago to help with their symptoms. Every morning and night, and throughout the day as needed we apply our oils, underneath the big tow and up the center of the foot is one of the spots we put them. So nice to see that diagram. Do you know if they use any synthetics in their biological make up of this product?? Very Interesting!